Written by internationally renowned scholars, this Companion maps the moral teachings of the world’s religions, and also charts new directions for work in the field of religious ethics. Compares the ways in which the religions provide resources for addressing current moral challenges in areas such as ecology, economics, global dynamics, religious war, human rights and other topics. William Schwieker is Director of the Martin Marty Center and Edward L. Ryerson Distinguished Service Professor of Theological Ethics in the Divinity School, University of Chicago. He is the author of Mimetic Reflections: A Study in Hermeneutics, Theology and Ethics (1990); Responsibility and Christian Ethics (1995); Power, Value and Conviction: Theological Ethics in the Postmodern Age (1998); and Theological Ethics and Global Dynamics: In the Time of Many Worlds (2004). He has published numerous articles and award-winning essays, as well as edited and contributed to five volumes on moral theory and hermeneutics. 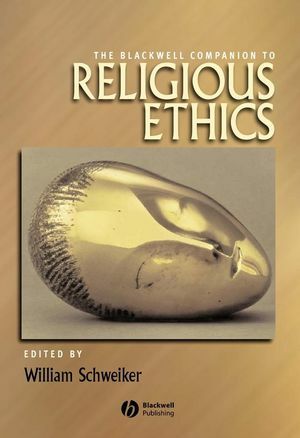 On Religious Ethics: William Schweiker (University of Chicago). 1. Moral Theories:Robin W. Lovin (Southern Methodist University). 2. Moral Truth: Maria Antonaccio (Bucknell University). 3. Agents and Moral Formation: Thomas W. Ogletree (Yale University). 4. Ideas of Ethical Excellence:Lee Yearley (Stanford University). 5. Practical Reasoning and Moral Casuistry: Albert R. Jonsen (University of. 6. Authority and Religious Experience:Darrell J. Fasching (University of South Florida). 7. Text and Canon: Michael Fishbane (University of Chicago). 8. Practices:Francis X. Clooney (Boston College). 9. Ritual:Francisca Cho (Georgetown University). 10. Saints and Exemplars:Lamin Sanneh (Yale University). 11. Law and Religion:Winnifred Fallers Sullivan (University of Chicago). 12. Norms, Values and Metaphysics:Franklin I. Gamwell (University of Chicago). 13.Cosmology:Frank E. Reynolds and Jonathan Schofer (University of Chicago). 14. Culture and Moral Pluralism:Bruce Grelle (California State University, Chico). 15. History of Religions:Donald K. Swearer (Swarthmore College). 16. Comparison in Religious Ethics:Sumner B. Twiss (Florida State University). 17. Jewish Ethics? : Hilary Putnam (Harvard University). 18. Foundations of Jewish Ethics: Ronald Green (Dartmouth College). 19. Ethics Differentiated from the Law: Shaul Magid (Jewish Theological Seminary). 20. From Law to Ethics...and Back: Nancy Levene (Williams College). 21. Christian Ethics? : Gene Outka (Yale University). 22. Origins of Christian Ethics: Jozef M. L. Van Gerwen (University of Antwerp). 23. Differentiations in Christian Ethics: Vigen Guroian (Loyola College, Baltimore). 24. Trajectories in Christian Ethics: Jean Porter (University of Notre Dame). 25. Muslim Ethics? : Ebrahim Moosa (Duke University). 26. Origins of Islamic Ethics: Foundations and Constructions: A. Kevin Reinhart (Dartmouth College). 27. Islamic Ethics: Differentiations: Abdulaziz Sachedina (University of Virginia). 28. Muslim Ethical Trajectories in the Contemporary Period: Frederick Mathewson Denny (University of Colorado, Boulder). 29. Buddhist Ethics? : John Ross Carter (Colgate University). 30. Origins of Buddhist Ethics: Damien Keown (Goldsmiths College, The University of London). 31. Cultural Differentiation in Buddhist Ethics: Thomas P. Kasulis (Ohio State University). 32. Buddhist Ethics: Trajectories: Charles Hallisey (University of Wisconsin, Madison). 33. Hindu Ethics? : Roy W. Perrett (University of Hawaii). 34. Origins of Hindu Ethics: Anne Monius (University of Virginia). 35. Differentiations in Hindu Ethics: Maria Heim (California State University, Long Beach). 36. Trajectory of Hindu Ethics: Joseph Prabhu (California State University, Los Angeles). 37. Chinese Ethics? : Eske Møllgaard (Hofstra University). 38. Origins of Chinese Ethics: Philip J. Ivanhoe (University of Michigan). 39. Differentiations in Chinese Ethics: Mark Csikszentmihalyi (University of Wisconsin, Madison). 40. Trajectories of Chinese Ethics: Mark Berkson (Hamline University). 41. African Ethics? : Barry Hallen (Morehouse College). 42. Origins of African Ethics: Segun Gbadegesin (Howard University). 43. Differentiations in African Ethics: Benezet Bujo (University of Fribourg). 44. Trajectories in African Ethics: Laura Grillo (Pacifica Graduate Institute). PART III: MORAL ISSUES . 45. Economics: Max L. Stackhouse (Princeton Theological Seminary). 46. Technology: Gerald McKenny (University of Notre Dame). 47. Ecology: William French (Loyola University, Chicago). 48. Nations: Jean Bethke Elshtain (University of Chicago). 49. Global Dynamics: Sallie B. King (James Madison University). 50. Religious Membership: Robin Gill (University of Kent,. 51. Human Rights: Simeon O. Ilesanmi (Wake Forest University). 52. Future Generations: Svend Andersen (University of Aarhus). 53. Health: Katherine K. Young (McGill University). 54. Body Culture: Regina Ammicht-Quinn (Center for Ethics in the Sciences,. 55. Religion and Religious War: John Kelsay (Florida State University). 56. Moral Development: Don S. Browning (University of Chicago). 57. Indigenous Peoples and Religious Moral Identity: Vine Deloria, Jr. (University. Glossary of Basic Terms: David Clairmont (University of Chicago). Written by internationally renowned scholars.